A “Dry Summer” in Wooster? I moved to Wooster at the very end of July. Since that time, I’ve heard a frequent refrain that “it’s been a dry summer”. Being a climate scientist, and knowing that everyone (including me) likes to complain about the weather, I thought I’d fact-check my neighbors. In meteorology, “summer” usually means June, July, and August (JJA). Based on data from the Wooster Experimental Station, 11.12 inches of rain fell during JJA 2017. Is that dry? It turns out, that’s nearly average. The Wooster weather station goes back to the 1800s, and for the period 1900-2016*, the average JJA precipitation was 11.52 inches. The minimum is 4.34 inches (1910), and the maximum is a 23.72 inches (1935). However, my neighbors may be on to something, because digging deeper, most of that rain fell in June and July. 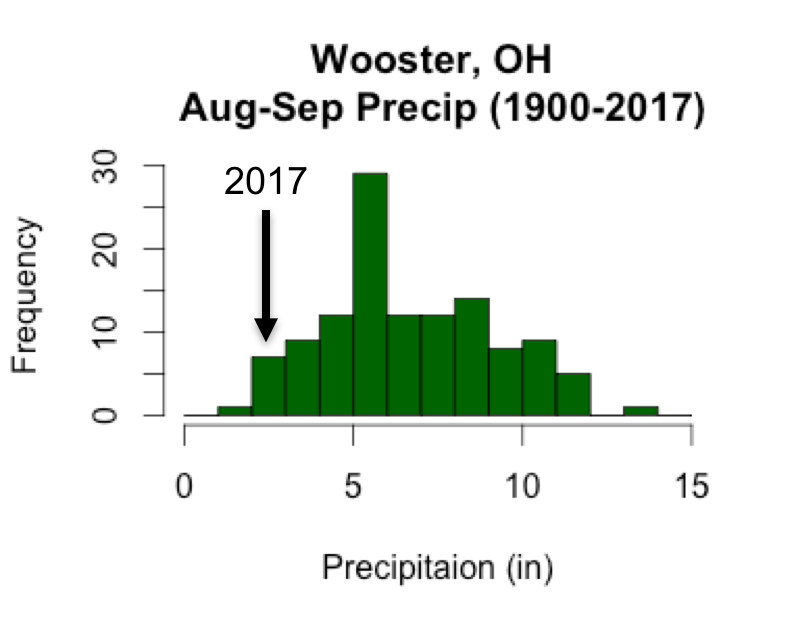 Early summer was really wet actually — the 9.83 inches Wooster received in June and July was greater than 75% of all years since 1900. In August, though, we only received 1.29 inches — well below average. September was even drier at 1.13 inches. The main storm track that brings rain to Wooster has been farther north than normal since July, and most storms have missed us. We also often receive rain from the remnants of hurricanes in September. Although September had plenty of Atlantic hurricanes, Harvey is the only one that affected Wooster, dropping 0.76 inches of rain. That’s a pittance for a tropical system, but it was also over half the rain we saw all month. If you combine August and September, we had 2.42 inches of rain. That’s good for 4th lowest since since 1900 (Figure 1). Also, it’s the lowest August-September precipitation since 1922 — almost 100 years ago. So yeah, this is rare. Figure 1. In 2017, Wooster received 2.42 inches of precipitation in August and September. That’s 4th lowest since 1900. Data from National Centers for Environmental Prediction. In fact, it’s so rare that Wooster is currently in a moderate drought (Figure 2). Cincinnati, Louisville, and other cities farther south are fine — they received ample rain from the tropics this year. Much of the midwest is dry, though. With that said, these midwest droughts are nowhere near as bad as the recent one in California (which still lingers in southern California, by the way). They are not as bad as what Montana and the Dakotas are currently facing, either. Besides the moderate severity, they’re also currently short-term droughts — meaning it’s only been around for a few months. Such droughts may have adverse impacts on agriculture, but there’s typically no long-term impact. Just hope for plenty of snow this winter! Figure 2. 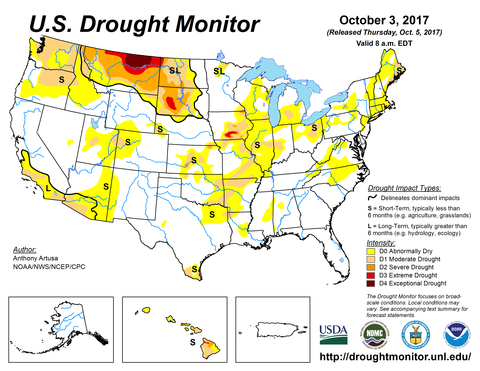 Droughts in the USA as of 3 October 2017. Wooster, OH is in a short-term moderate drought. Data from drought.gov. *There are some data gaps before 1900 in the NCEI data, so I skipped those years.